On the 24th of April 2018 I was assigned to take a three days private tour in Lilongwe and a day trip to the Lake (lake malawi ).We had a good city tour of Lilongwe City.The second day of the tour we went to the Lake, enroute to the Lake we had a short tour of Kuti Wildlife Reserve.Had a great time on a Bike Safari around the reserve.It was a successful trip in Malawi for my guest. This medal was presented to me by the Man himself Jim Kitchen who was my guest for this Private tour.He presented this award to me as his token of appreciation that he did enjoyed the days with me on this tour.I’m quite impressed indeed when he presented me this great award as I had never been awarded with such an award before. 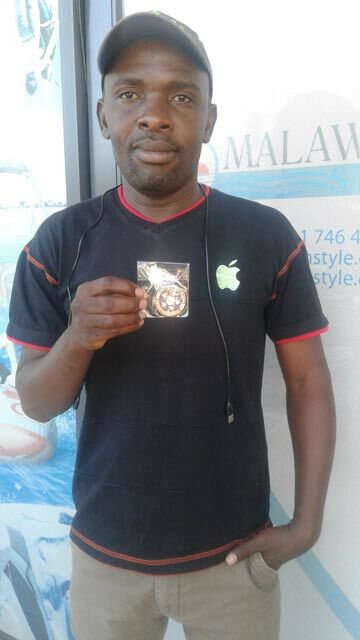 I may say this Medal Of Honour Will mean Alot to me.It was my Great Pleasure and Honour to be Mr Jim Kitchens Tour Guide on his tour of Malawi,I enjoyed our three days together!